If you love ballet this is the place for you! I have included ballet pictures, reviews, links, and more! Please feel free to e-mail me things you want to be on the site. I want it to be the best that it can be so submit your ballet stories, reviews,ect! Ballet is a beautiful and graceful form of dance which requires great skill, technique and concentration. Whether you're already a fan of the discipline or are just curious about it, there is plenty to be said about the centuries-old art of ballet. Read on to learn more about the basics of ballet, including its history, fun facts, common steps and more. Ballet is a type of flowing, graceful dance which uses steps born from five basic foot and arm positions. A ballet dance usually tells a story set to music. The history of ballet is rich in tradition and can be traced back to Renaissance Italy, but the first "formal" ballets were performed in the early 1600's. Up until 1681, only men were allowed to dance and men wearing masks danced women's parts. Over time, ballets encompassed fanciful costumes including wigs, masks and heeled shoes. Often, performers not only danced, but also sang songs and recited poems. Today's ballets may be re-stagings of old ballets or completely new works created by modern choreographers and dance companies. They are performed in front of large audiences or small groups. They usually involve intricate set designs and beautiful costumes. A ballet may consist of a minimal amount of dancers or it may employ an entire company or troupe. Music may be classical or modern, fast or slow. 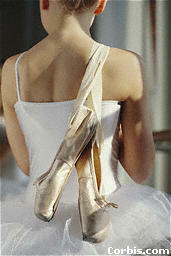 Choreography may be traditional or edgy, but all types of ballets build on the core steps, positions and arm movements. With such a long history, ballet can claim many, many famous dancers. A few of them are Vaslav Nijinsky, Anna Pavlova, Rudolf Nereyev, Dame Margot Fonteyn, Melissa Hayden, Nora Kaye, Maya Plisetskaya, Mikhail Baryshnikov, Robert Joffrey, Natalia Makarova, Darci Kistler, Irek Mukhamedov and Sylvie Guillem. Many ballet steps originated with the dance form and are still used today. You can expect to see an Arabesque, Chasse, Pique, Pirouette, Develope, Echappe, Glissade, Pas de Chat and a Grand Battement among others. These steps range in difficulty from small, simple foot movements to grandiose leaps with large arm movements. The first ballet school was opened in France in 1661 by Louis XIV. Most of the original steps taught in France still have their original French names. The basic five foot positions were created in the 1600's by French choreographer Pierre Beauchamp. Female ballerinas may dance en pointe (on their toes with hard-tipped shoes), but male dancers only wear soft-soled shoes. Some of the most famous ballets are: The Nutcracker, Romeo and Juliet, and Swan Lake. PLEASE DON'T STEAL MY PICTURES OR TEXT!!! I'VE WORKED HARD FOR HOURS ON THIS SITE, IF YOU WANT TO MAKE A SITE MAKE IT YOUR SELF, DON'T STEAL MINE!!! THANK YOU!